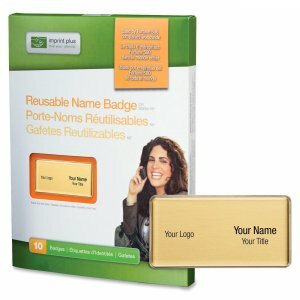 Gold badges are part of the Imprint Plus Mighty Badge Reusable Name Badge System that offers a quick, easy way to create and customize reusable name badges. Each versatile badge features a rectangular metal plate; elegant domed lens cover; and extra-strong, magnet fastener to secure the badge in place even during the most hectic days. Fasteners affix your name badges even through the thickest fabrics, including knits, sport jackets, and even winter outerwear. To personalize each badge, apply a printable transparency (sold separately) that you can replace again and again. Set includes 100 metal plates (1-1/2" x 3"), 100 lens covers and 100 magnet fasteners.